Discussion in 'Freshwater Beginners' started by Hill Dweller, Apr 14, 2017. I use a few oak leaves in my tank along with 3 pieces of driftwood as my tap water is 7.8ph, a little higher than I'd like. I am interested in increasing the leaves and I love the look of tanks with leaf litter and some of the biotope and black water tanks you see. They are amazing! How do any of you leaf litter folks clean/vacuum the substrate? 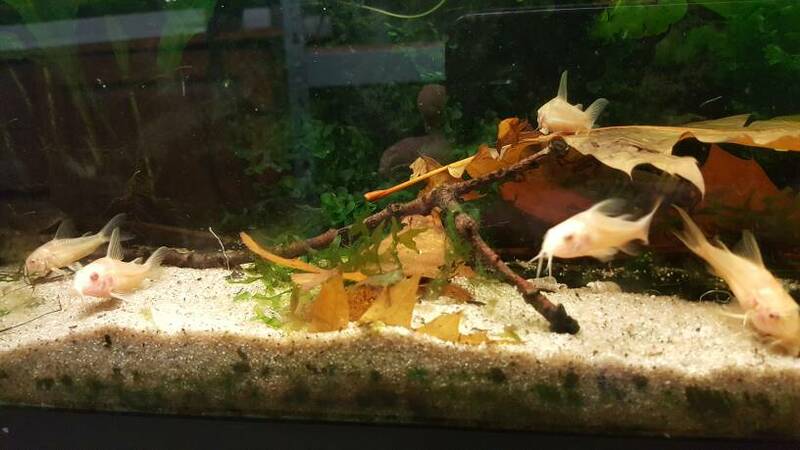 I have been taking out my few leaves and a few other things while I vacuum to ensure I'm not missing big patches of substrate, but if you have lots and lots of leaves and litter, it seems like such an ecosystem all of its own, how do you approach cleaning? I have no advice, I'm sorry, but definitely interested in responses. Would u post a pic of your tank? I let them decay to a certain stage. I hardly syphon the substrate. Well right now the tank is easy to clean so long as I pick out my few leaves and sometimes I take out the wood to get to gunk that gets under the crannies. It's only been running 2 months and is only 10 gallons, so I'm feeling a bit particular about keeping it quite clean as I understand these smaller tanks are more prone to faster spikes and crashes. But I just wonder how people look after tanks like this one pictured where the leaves cover lots of the substrate. Do you take them out to vacuum, or do you wriggle the vacuum underneath the leaves and stir it all up or just wave the vac near the top like you do with sand so only bits of gunk on the top are collected up? Maybe it depends on whether it's sand or gravel underneath? So many questions getting back into this hobby after 20 years, haha! Thanks @DoubleDutch, I was hoping you might answer, I so enjoyed your video of your big school of corys that you posted this week in a different thread, they looked so happy grubbing about in all the leaves! I was definitely curious how you cared for it, appreciate the tips! If / when you'd remove them a bit earlier, there will be less "dirt" !!! I noticed that oakbranches will even last longer !!! My favourites are beech (color and shapewise). They'll decay faster though.